Triacylglycerols represent the largest energy reservoir of the body. The primary fat storage organ is white adipose tissue (WAT), which grows in response to excess energy intake, eventually leading to obesity, and shrinks in response to starvation. In addition to its function as an energy storage organ, the finely tuned regulation of triacylglycerol synthesis and degradation in WAT is required for control of circulating lipid levels. 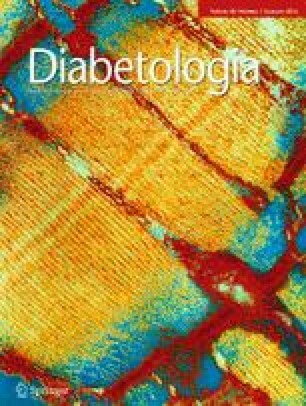 Defective WAT function may result in dyslipidaemia and fatty acid overload of non-adipose tissues, inducing ectopic triacylglycerol deposition, which is associated with insulin resistance, inflammation and impaired metabolic function of insulin-sensitive tissues . This can occur in obese individuals when the storage capacity of adipose tissue is exceeded and in patients with loss-of-function mutations in genes regulating lipid storage, e.g. mutations in the gene encoding lipid droplet protein perilipin 1, which limits the access of lipases to fat stores, leading to lipodystrophy and severe insulin resistance . Thus, efficient fatty acid storage in the form of inert triacylglycerol can be considered as a protective mechanism counteracting dyslipidaemia and metabolic disease. In the current issue of Diabetologia, El-Assaad et al  describe the phenotype of mice lacking G0s2, the protein product of which (G0/G1 switch protein 2, G0S2) functions as a lipolysis inhibitor and consequently increases fat storage. Mechanistically, G0S2 acts by inhibiting adipose triglyceride lipase (ATGL) activity, which is required for efficient mobilisation of triacylglycerol stores . ATGL-deficient mice are obese and also accumulate triacylglycerols in non-adipose tissues, including liver and muscle. These mice exhibit strongly reduced lipolysis, causing a shift from fatty acid to glucose oxidation, which is associated with improved glucose tolerance and insulin sensitivity, as well as protection against high-fat diet (HFD)-induced insulin resistance [5, 6, 7]. Considering triacylglycerol storage as a protective mechanism, one would expect G0S2-mediated inhibition of lipolysis to protect against insulin resistance. In line with this expectation, adipocyte-specific overexpression of G0s2 reduces lipolysis and increases fat mass. Despite increased obesity, these transgenic mice display decreased plasma fatty acid, triacylglycerol and insulin levels, as well as improved glucose and insulin tolerance . These observations closely resemble the phenotype of mice lacking ATGL [5, 6, 7]. Based on observations in mice overexpressing G0s2 in adipose tissue, one would expect G0S2 deficiency to cause fatty acid overload, dyslipidaemia, and insulin resistance. In contrast to these expectations, El-Assaad et al  demonstrate that a lack of G0S2 affords protection against obesity and insulin resistance in HFD-fed mice. This was explained by increased β-oxidation and mitochondrial uncoupling, leading to increased energy expenditure and thermogenesis. The work of El-Assaad et al confirms and adds to previous studies showing that mice lacking G0S2 are lean, cold-tolerant and protected against HFD-induced insulin resistance [9, 10]. Hence, G0S2 can be considered as key regulator of energy homeostasis, controlling both fatty acid availability and fatty acid oxidation. G0S2 is expressed in most insulin-sensitive tissues, including liver, heart and skeletal muscle, suggesting that the regulatory function of G0S2 is not limited to adipose tissue . Notably, G0s2 overexpression in the liver increases steatosis and suppresses fatty acid oxidation rates [9, 11]. Conversely, loss of G0S2 in the liver increases oxidative gene expression and enhances ketogenesis, resulting in a marked decrease in hepatic triacylglycerol levels. Furthermore, liver-specific knockdown of G0S2 protects against liver steatosis and improves insulin sensitivity, implying that the lack of G0S2 specifically in the liver has a beneficial effect on systemic energy metabolism [3, 9]. It will be interesting to see in future studies whether adipose-specific deletion of G0S2 can reduce obesity without worsening insulin sensitivity. Furthermore, there are currently no data on the role of G0S2 in muscle, the primary site of insulin-mediated glucose uptake. ATGL activity is regulated in a complex manner that involves the activator protein comparative gene expression–58 (CGI-58), G0S2 and lipid droplet proteins of the PAT family (for a review, see ). Nutritional regulation of G0S2 implicates a central role of this protein in the control of lipolysis. G0S2 levels in the liver are elevated in response to fasting, which favours hepatic fat deposition and reduces fatty acid oxidation. At the same time, low G0S2 levels in WAT promote lipolysis. Conversely, re-feeding induces a rapid increase of G0S2 in WAT and its downregulation in liver . Thus, changes in G0S2 in response to the feeding status channel fatty acids either to WAT or liver (Fig. 1). Changes in G0S2 levels are observed within a few hours of feeding or food restriction [4, 9], suggesting that this protein is required for rapid metabolic adaptations. The mechanism responsible for the effects of G0S2 on fatty acid oxidation remains elusive. Zhang et al  suggested that the metabolic changes observed in hepatic G0S2 knockdown mice occur independently of PPARα, a major regulator of fatty acid uptake and utilisation, whereas El-Assaad et al  observed upregulation of PPARα-target genes involved in mitochondrial and peroxisomal β-oxidation. G0S2 has been implicated in the regulation of diverse biological processes, including apoptosis, cell cycle control, cancer cell proliferation and mitochondrial ATP production in different cellular settings (for a review, see ). These diverse biological actions might rely on the ability of G0S2 to interact with different proteins, such as nucleolin , BCL2 , and F0/F1-ATPase . Specifically, its interaction with the mitochondrial proteins BCL2 and F0/F1-ATPase suggests that G0S2 can directly modulate mitochondrial function. However, it is important to note that overexpression of ATGL in adipose tissue is sufficient to cause a lean phenotype, obesity resistance and increased fatty acid oxidation . These observations indicate that the metabolic phenotype of G0S2-deficient animals may also represent an adaption to the increased availability of fatty acids without direct effects on mitochondrial fatty acid oxidation. From an evolutionary perspective, the enormous fat storage capacity of adipose tissue may be explained by the fact that increased fat storage during periods when food is abundant represents a survival advantage in times of famine. The ‘thrifty genotype’ hypothesis  suggests that obesity is caused by positive selection for genes that favour energy storage. In modern society, where individuals lead a more sedentary lifestyle and consume an energy-rich diet, thrifty genes have became disadvantageous, predisposing people to obesity and obesity-related disorders. Given that G0S2 affects systemic energy metabolism in humans by increasing fatty acid storage and reducing fatty acid oxidation, G0S2 can be considered as a prototype of a thrifty gene. A rational approach to treating obesity would be to increase energy expenditure, possibly by inhibiting thrifty genes. Increased energy expenditure can be attained by activating brown adipose tissue, which has an enormous capacity to transform energy into heat. In addition, WAT can adopt the thermogenic characteristics of brown fat, which is then referred to as beige fat (see review ). Published data clearly demonstrate that G0S2 deficiency increases lipolysis, fatty acid oxidation and thermogenesis in mouse models with different genetic backgrounds. These observations identify G0S2 as a highly interesting target for the treatment of obesity. Little is currently known about the physiological and pathophysiological role of G0S2 in humans. Yet, it has been shown that human G0S2 inhibits human ATGL in a dose-dependent manner . Furthermore, human G0S2 is downregulated in WAT by fasting and in individuals with poorly controlled type 2 diabetes [21, 22]. Unfortunately, to date, G0S2 expression in the liver of diabetic patients has not been investigated. High hepatic G0S2 levels would strongly suggest a role of the protein in the development of non-alcoholic fatty liver disease, since data from animal studies indicate that hepatic G0S2 levels are upregulated in response to HFD feeding [4, 23]. In combination with the observed downregulation of G0S2 in WAT, high expression of G0S2 in the liver would result in a metabolic condition promoting liver steatosis and insulin resistance. In summary, the characterisation of G0S2-deficient mice has provided compelling evidence that G0S2 regulates important aspects of energy metabolism through its ability to restrict ATGL-mediated lipolysis and fatty acid oxidation. Apart from its function in energy metabolism, G0S2 may regulate other cellular processes, such as proliferation and apoptosis. Defining the full spectrum of tissue-specific G0S2 actions will be an important challenge for future research. Yet, the beneficial effects of G0S2 deficiency on energy and lipid metabolism identify G0S2 as a highly interesting target for the treatment of obesity and obesity-related disorders. Both authors were responsible for drafting the article and approved the version to be published.